Who’s afraid of the big bad wolf? Not you, because you are him in The Wolf Among Us. This game from Telltale (the creators of The Walking Dead game) immerses the player in an entirely new view of some favorite fairytale characters. Notable appearances range from stories such as Beauty and the Beast, Snow White, Alice in Wonderland and even Little Red Riding Hood. The story unfolds in Fabletown which is modern-day Manhattan, New York, during 1986. Fantasy characters, or “fables”, are not the only inhabitants. The native humans are known as “mundies”, and to hide their real identity every non-human looking fable must purchase enchantments to blend in. The protagonist of this game is Bigby, aka the Big Bad Wolf. Bigby is the local sheriff of Fabletown who helps maintains the town's normal appearance as to not blow their cover. All the while, trying to contain and move on from the monster he once was. Most of this game at surface level is influenced heavily by the fantastic work that Telltale has done with The Walking Dead. The art has the same cel shading style which meshes well with this games comic book roots. The player is presented with dialog and combat choices as well as a countdown to create real-time reactions. As decisions are made, small text appears in the corner of the screen occasionally, to remind the player that their choices have an effect. Every decision changes the players relationships with other characters. At the heart of countless decisions you can choose to be a good cop or bad cop. However, at times the line becomes fuzzy and it comes down to the lesser of two evils. There were numerous aspects which contributed to my falling head over heels for this game. Storytelling helped me fall further into the rabbit hole that is this game. The constant action means no looking away, even if only for a moment, and loving every minute of it. Instead of a shining, happy side of the characters from tales we all know, some gritty and dark versions are brought to light in a new way. Something that differentiates this game from The Walking Dead, despite it’s similarities, is the action. There is much more combat; yet, it does not take away from the story in the slightest but enhances it. The feeling of having a physical presence in game, as opposed to just your words, is exhilarating. However, being enamored with this game did not take away from the few noticeable flaws. The game being episodic is one of the few cons to the overall experience, waiting for the release every month becomes torture for those ingrained in the story. Each episode begins with a refresher of the story so far, but at times it seems a little lackluster and unfulfilling. Another element that pulled me out of the in depth experience of this game was an issue with frame rate. Although this may be an issue on my personal computer's performance, after further investigation, I found that many others had issues with this as well. A skip here and there really took away from the story having a hold on me. 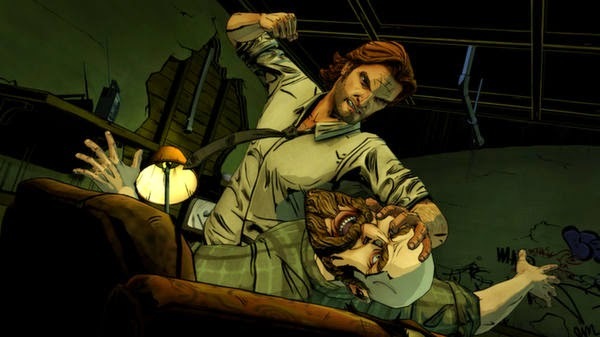 Overall, Telltale did a spectacular job of tearing this story from the pages of a comic book and bringing it to life. The action, story and unique view of characters that we all know from tales prior brings a new and refreshing experience to gamers. While frame rate and the inevitable wait for new episodes to be released (for those playing the game currently) are a downside, these minor drawbacks won’t ruin the game. I strongly suggest this game for anyone who enjoys an in depth story with rich characters and the ability to take action when needed.